Seldom can a song leader suggest a time for favorites from any congregation without receiving at least one request for "The Old Rugged Cross." 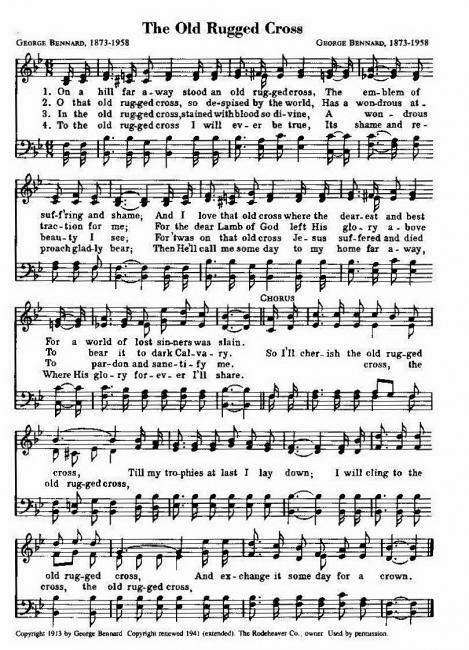 This gospel hymn, a sentimental favorite of Christians and unsaved alike, was written by George Bennard in 1913. It is generally conceded to be the most popular of all twentieth century hymns. George Bennard was born in Youngstown, Ohio, but his parents soon moved to Albia, Iowa, and later to the town of Lucas in the same state. It was here that young George made his personal acceptance of Christ as his Savior. Following the death of his father before George was sixteen years of age, he entered the ranks of the Salvation Army. Bennard and his first wife served for a period of time as officers in this organization. Shortly after writing this hymn, George Bennard sent a manuscript copy to Charles Gabriel, one of the leading gospel hymn composers of that era. Gabriel's prophecy, "You will certainly hear from this song," was soon realized as "The Old Rugged Cross" became one of the most widely published songs, either sacred or secular, in this country. Bennard continued his evangelistic ministries for forty additional years following the writing of this hymn. He wrote other favorite gospel hymns, but none ever achieved the response of "The Old Rugged Cross." On October 9, 1958, at the age of eighty-five, Bennard exchanged his "cross for a crown." He spent the last years of his life by the "side of the road," a few miles north of Reed City, Michigan. Near this home there still stands a twelve foot high cross with the words, "‘The Old Rugged Cross' - Home of George Bennard, composer of this beloved hymn." Although it has often been stated that we do not worship the cross as such but rather the Christ of the cross, one cannot ponder the truths of Christ's atonement without a keen awareness of the centrality of the cross in God's plan of redemption for lost mankind.